There are a few things you can do that can decrease the amount of time it take Nagios to startup (or restart). These speedups involve easing some of the burden involved in processing your configuration files. Some of these steps can be quite time-consuming when you have large or complex configurations. Is there a way to speed any of these steps up? Yes! Before we get on to making things faster, we need to see what's possible and whether or not we should even bother with the whole thing. This is easy to do - simply start nagios with the -s command line switch to get timing and scheduling information. An example of the output (abbreviated to only show relevant portions) is shown below. For this example, I'm using a Nagios config that has 25 hosts defined and just over 10,000 services. object configuration would be useful. Timing information on configuration verification is listed below. Okay, lets see what happened. Looking at the totals, it took roughly 11.6 seconds to process the configuration files and another 56 seconds to verify the config. That means that every time I start or restart Nagios with this configuration, it will take nearly 68 seconds of startup work before it can monitor anything! That's not acceptable if I have to restart Nagios on a semi-regular basis. What can I do about this? Take another look at the output and you'll see that Nagios estimates that I could save about 8.4 seconds off the configuration processing time and another 54.7 off the verification times. In total, Nagios thinks I could save 63 seconds of the normal startup time if some optimizations were taken. Whoa! From 68 seconds to just 5 seconds? Yep, read on for how to do it. Nagios can spend quite a bit of time parsing your config files, especially if you make use of the template features such as inheritance, etc. 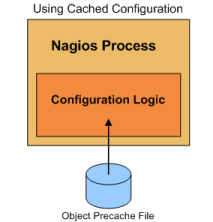 In order to reduce the time it takes to parse your config, you can have Nagios pre-process and pre-cache your config files for future use. When you run nagios with the -p command line option, Nagios will read your config files in, process them, and save them to a pre-cached object config file (specified by the precached_object_file directive). This pre-cached config file will contain pre-processed configuration entries that are easier/faster for Nagios to process in the future. You must use the -p command line option along with either the -v or -s command line options, as shown below. This ensures that your configuration is verified before the precached file is created. The size of your precached config file will most likely be significantly larger than the sum of the sizes of your object config files. This is normal and by design. Once the precached object configuration file have been created, you can start Nagios and tell it to use the precached config file instead of your object config file(s) by using the -u command line option. If you modify your configuration files, you will need to re-verify and re-cache your configuration files before restarting Nagios. If you don't re-generate the precached object file, Nagios will continue to use your old configuration because it is now reading from the precached file, rather than your source configuration files. The second (and most time-intensive) portion of the configuration startup phase is the circular path check. In the example above, it took nearly a minute to perform this step of the configuration verification. It is of utmost importance that you verify your configuration before starting/restarting Nagios when skipping circular path checks. Failure to do so could lead to deadlocks in the Nagios logic. You have been warned. Follow these steps if you want to make use of potential speedups from pre-caching your configuration and skipping circular path checks. 2. Stop Nagios if it is currently running. 4. When you modify your original configuration files in the future and need to restart Nagios to make those changes take place, repeat step 1 to re-verify your config and regenerate your cached config file. Once that is done you can restart Nagios through the web interface or by sending a SIGHUP signal. 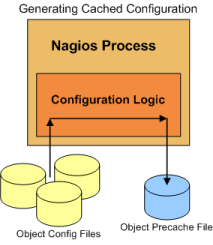 If you don't re-generate the precached object file, Nagios will continue to use your old confguration because it is now reading from the precached file, rather than your source configuration files. That's it! Enjoy the increased startup speed.